EasyChef Select Charcoal and Wood Outdoor Cooking Systems from Sierra Products, Inc.
Offering quality features and economy, the EasyChef Charcoal Built-in Series grills are constructed of rugged heavy duty steel and finished with a high temperature coating. Each grill includes a Vari-Lift that raises and lowers the charcoal for cooking heat adjustment with just a turn of the handle. For additional value and added life, the ECC Units include as standard stainless steel cooking grids. 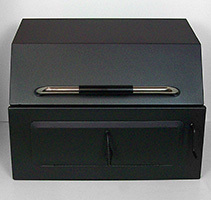 Available in both Counter Top and Front Load models the ECC units fit both standard 24" and 31" openings. Optional feature include Stainless Steel Hood, Warming Rack, and Rotisserie Kit. Fire Magic, Barbeques Galore, and many others. Easy to replace the older grills in islands and masonry construction. Manufactured from plate steel, the EasyChef chassis will provide years of service. 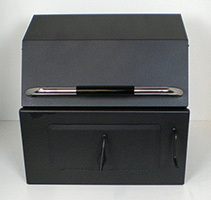 Allows for raising and lowering of charcoal tray to control temperature. Easy turn handle makes for quick adjustments. Quality coating adds overall value and protection. Welded 304 stainless steel rod, the optimum cooking surface. Both the ECC30 and ECC24 provide generous cooking areas. Limited lifetime warranty. These options add value to your built-in by providing balanced heat and baking. Rotis option expands your cooking opportunities to Rotisserie prepared foods. 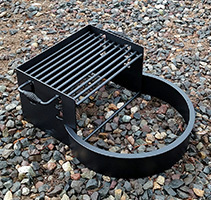 The Park Barbeque offers a simple low maintenance solution to charcoal grilling. 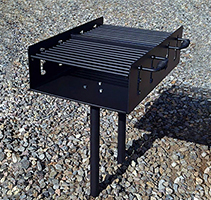 Heavy steel cooking grid is adjustable and the frame is finished in high temperature BBQ black for easy touch up. All the EasyChef Charcoal Series grill deliver maximum value! The expanded EasyChef Park and Camp Ground Barbeque line up offers a simple low maintenance solution to wood and charcoal grilling. All manufactured from heavy duty steel plate for years of service. 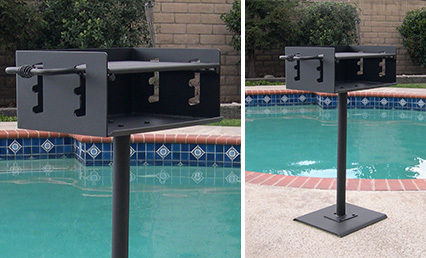 Iron bar cooking grid is adjustable and the frame is finished in high temperature BBQ black for easy touch up. All the EasyChef Charcoal Series grill deliver maximum value! Slotted chassis makes adjusting the grid height a snap. 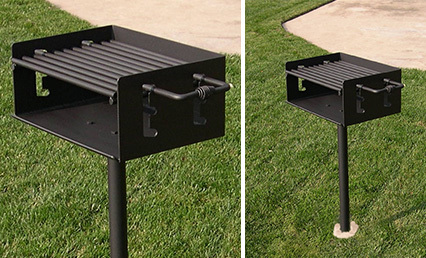 In-ground post or patio base make this one of the easiest charcoal grills to install.